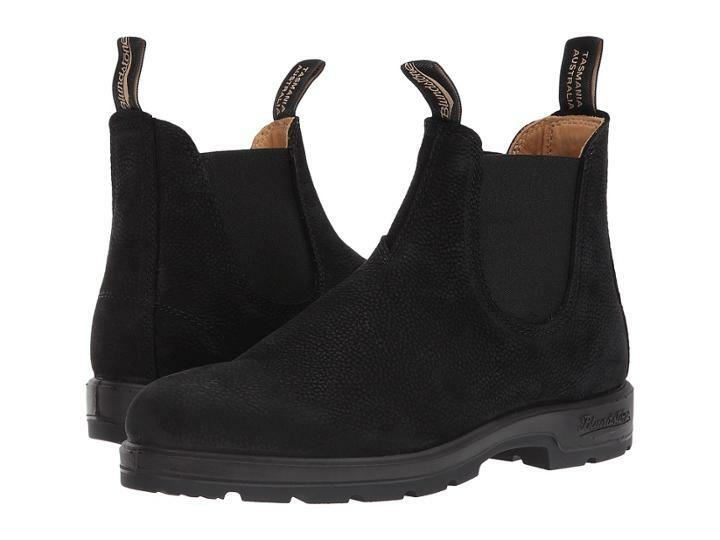 The Blundstone BL1466 boot keeps you comfortable and in style all year long. Nubuck leather upper. Sturdy front and back pull-on tabs. Elastic gore side panels retains its shape. Soft leather lining for a comfortable fit. Cushioned footbed for added comfort. Shock Protection System (SPS) disperses shock at the heel strike and reduces skeletal stress on the feet knees and vertebrae. It also includes PORON XRD padding at heel the world's most advanced microcellular shock-absorbing protection for underfoot comfort. PU midsole offers superior cushioning and comfortable wear. TPU outsole is oil and acid resistant. Imported. Measurements: Heel Height: 1 1 4 in Weight: 1 lb 4 oz Shaft: 6 in Platform Height: 3 4 in Product measurements were taken using size AU 10 (US Men's 11) width Medium. Please note that measurements may vary by size. Weight of footwear is based on a single item not a pair.